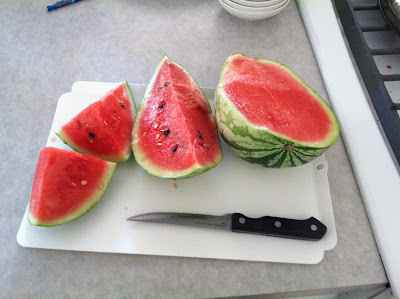 Six weeks after discovering our first watermelon, it’s eating time! Since this one was hanging over the wall, we had to move it. Maybe that’s what stunted the top. Verdict: yummy! Not the best I’ve ever had, but lots of flavor – not too sweet. I might try a slice with salt, or maybe I’ll go crazy and try cayenne. 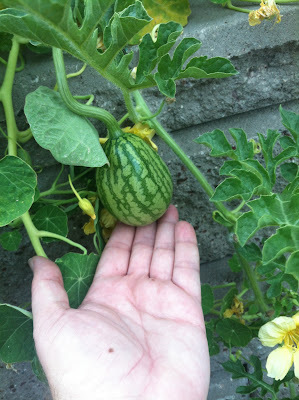 We’ve spotted at least 3 other melons, and they seem to have grown a little bigger. 2 Responses to Our first watermelon! Nice melon. We considered growing watermelon, but space was an issue. How much space did your vine/plant take up? 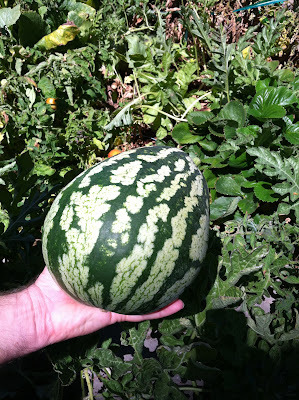 We recently discovered our last watermelon of the season, hidden in some nasturtiums. Probably way underripe – we’ll probably crack it in a week. It’s hard to say how big the vines got – a lot of ’em were hidden under other plants. I’d say it easily crept to an 8′ diameter. But it’s not like it took up all that space – it just spread out.